This yeast boasts an amazing ester and spice profile for Saisons and Specialty Ales. This yeast has the added benefit of a short lag time unlike some specialty yeasts on the market. 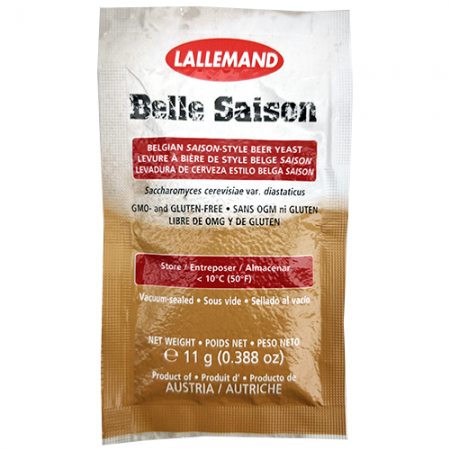 Lallemand's Belle Saison can keep up the pace while fermenting at high attenuation levels and even higher alcohol tolerances. Ferment this yeast in a temperature controlled environment, we highly reccomend keeping your fermenter above 25C to 35C to experience the full effect of the yeasts profile. LalBrew® Belle Saison is a Belgian-style ale yeast selected specifically for its ability to create Saison-style beers. Belle Saison is a diastaticus strain that allows the brewers to achieve the high attenuation characteristic of this classic style. Designed for warm-temperature fermentation true to traditional “Farmhouse” production methods, beers brewed with LalBrew® Belle Saison are fruity, spicy and refreshing. For best practices when using Saccharomyces cerevisiae var. diastaticus strains please download our “best practices” diastaticus document under the Technical Data Sheet section. Classified as a Saccharomyces cerevisiae var. diastaticus, a top fermenting yeast. Aroma and flavor is traditional of Saisons with citrus and pepper notes. Saccharomyces cerevisiae var. diastaticus strains are capable of utilizing some types of dextrins. Extra care should be taken to ensure proper cleaning procedures are in place to avoid any cross-contamination with other brews.